""" keywords'/> "" " 5 Reasons Why to Learn Improvisation or Kill Acting Career | Best Actor Academy-The Monster Of Free Acting Tips ""
As an actor, you are always learning and growing and challenging yourself by trying different types of acting techniques. Today, however, I would like to focus on a very crucial tool for actors – and that is improvisation, or "improv" for short! Though an "improv" generally is required for a comedy, a reality show, commercial ads and films, it can be expected or demanded in an audition of any genre. While some casting directors may want the talent to strictly follow the script, others will encourage actors to play with the material to make it their own. "Improv" is where you create and perform a scene without a script! You create and make up a scene as you go along. It teaches you to be quick on your feet and ready to react when called upon. In today’s audition room, "improv" has quickly gone from a useful tool to a requirement, particularly in commercial auditions. At Best Actor Academy when I'm coaching on "one on One' or in a small group of 2 or 3 aspiring actors in Mumbai, I have started strongly emphasizing the importance of solid "mprov" training and have initiated individual structured improvisation exercises. I become an actor's partner in a scene when a trainee is alone in a session. B. An improvising a scene is not only to say yes, but yes, and.. You are supposed to agree and then add something of your own. If I start a scene with ‘I can’t believe it’s so hot in here,’ and you just say, ‘Yeah…’ we’re at a stand-still and the scene could become lifeless . 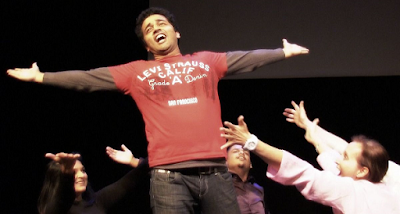 If you are wondering why Improvisation is good for actors, here are 5 great reasons! "Improv" is all about taking risks – it’s about diving into the unknown, without a plan, and saying YES to whatever is in front of you — and building further on that by adding more. What a fun! Once you practice taking risks in the safe space of an improvisation session, you will find yourself taking more risks in your auditions – and in your life! Improvisation skills make us stronger, smarter and gives us the trust we need to realize our ideas are good ideas. Knowing we can use our improvisation skills anytime gives us the freedom to take chances. When we take risks that others are scared to take… that’s when an exciting performance occurs. We shine as actors and as humans when we step past our fears. You likely know by now that first impressions are the most important. If you can walk in and out of a room confidently, you’re already on your way to success. By conquering our fears of jumping into the unknown — and literally creating entire stories out of nothing via "mprov" — we are sharpening our communication skills and our ability to connect and relate to other human beings in a variety of environments. We are becoming more confident. We are able to think and speak on our feet. Did you know that one of the number one fear among people is public speaking? "Improv" training will definitely enhance and expand your communication skills — both as an actor and as a professional in your industry. There is no time to hide in improvisation or in an audition. In order to move quickly on our feet, we must be open and ready to say yes to whatever is being called on us. Your scene partner says “So good to see you, my sister.” You must say YES — and become the sister in order to move the scene forward. If you said NO, the scene would stop right there. "Improv" will teach you to be both physically and mentally open and accepting to whatever is coming your way. Ask any football coach, and they’ll agree: you can’t catch the ball and score a touchdown if you aren’t open. Now, let’s talk about the “and” element of “Yes, and...!” So many young actors worry about being “right” for the part. So often they (and everyone else) spend most of their time trying to fit into a mold of what they think others want. The reality is, people (and producers) often don’t know what they want! They want you to show them what they want. "Improv" teaches us to quickly make big, strong choices. When you say yes to whatever is presented to you, whether it be a scene partner or a script, and then build upon that with strong choices, you will inspire excitement and ideas in others. Lastly, and most importantly, improvisation is a whole lot of fun. Enjoy auditions, enacting scenes or bonding with your co-actors through "improv" training. Give yourself permission to be silly and have a blast! After all, improvisation acting is famous for its hilarity, so go for it! Improvisation skills make us stronger, smarter and gives us the trust we need to realize our ideas are good ideas. Find your next audition at Audition Fox and get searched by casting directors.